A major Australian telescope just got a serious upgrade — one that will help it spot more potentially-habitable, far-off planets than ever before. 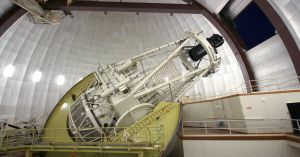 A broad team of Australian scientists just equipped the Anglo-Australian Telescope at Australia’s ANU Siding Spring Observatory with a new spectrograph called Veloce, which will help astronomers spot smaller planets orbiting dimmer stars than they could before. In order to be warm enough to potentially support life as we know it, these particular rocky planets need to orbit pretty closely to their host stars. That’s because the stars that Veloce was designed to find, called M dwarfs, are dimmer than those that less-sophisticated telescopes can spot and analyze. Veloce has already been used to confirm potential earth-like planets found by other research teams, such as NASA’s planet-hunting TESS satellite. As TESS spots possible planets, other astronomers race to analyze its data. Veloce is particularly well-equipped to probe more dimly-lit reaches of space — and find out whether these planets resemble Earth and therefore might be able to support some sort of life.